Your training and bodily preparations before the challenge, your strategy while eating the challenge, and a very confident mindset while dominating the challenge are by far the three main factors that will decide whether or not you will win your food challenge. While “Train. Strategize. Dominate.” are definitely the most important BIG keys to success, there are many other smaller pieces to the puzzle that you need to remember and follow so that you can guarantee victory. The next most important key to success is that you need to begin the challenge by eating at a very quick rate for as long as possible while you are fresh and feeling strong. As you learned by reading How Stomach Capacity Training Works, eating speed during a food competition has a geometric pattern, meaning that you can start off eating very fast in the beginning, but your speed will begin to decrease as time goes on until you are basically crawling (eating) at a snail’s pace. As shown in the graph above, you can eat a lot of food for the first ten to fifteen minutes before your body starts realizing that it is getting full. At the fifteen to twenty minute mark, depending on the person, your brain will start sending signals throughout your body to let it know that you are approaching maximum capacity, and your speed will then really start to slow down. At the thirty minute mark, and maybe even before, you will really notice that it is taking a lot more time to finish each bite than it did in the beginning when you were fresh and empty. This is why you really need to initially start out eating very quickly as soon at the timer starts, so that you can finish as much of the challenge as you can before your body starts to register that you are getting full. You may finish four pounds of food in the first twenty minutes, but it may take you twenty more minutes to finish that last pound. Start out eating fast and then coast to victory!! 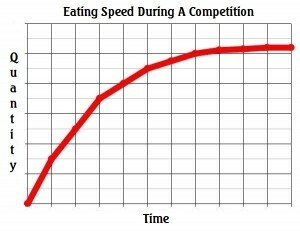 Most successful competitive eaters follow this method of eating, especially the ones that focus mainly on speed. There are a few eaters though that are not extremely fast, but they are able to maintain the same above average speed for a long time which means that they can eventually catch up to the faster eaters with a lower maximum stomach capacity once they begin to slow down, because they are still eating at that same above average pace. This is a classic example of “The Tortoise And The Hare” where the slow & steady turtle catches up and defeats the much faster rabbit who cannot maintain the same speedy pace the entire time. Eaters like this are much more suited for winning food challenges than winning eating contests because almost all eating contests are less than ten minutes in length. Most larger food challenges have a time limit of 45 minutes or more, so the slower, steady eaters have much more time to finish all their food before the time limit expires. While most eaters start out fast and eventually slow down, and some slower eaters try to maintain a similar steady pace for most of the time, there are absolutely ZERO successful competitive eaters that begin slow and end fast. The human body just doesn’t work like that. Whether you eat a lot or not as much, your body does still register that you are consuming food (energy), and signals will be transmitted after fifteen or twenty minutes of your slow and steady eating, so you will not be able to just “turn on the afterburners” and finish the big pile of food remaining before time expires. You may be able to speed up and eat a little faster, but it will not be fast enough to catch up or win the challenge. Especially if you are a beginner, you need to start out eating as fast as possible for as long as possible so that you finish as much of the challenge meal as you can before your pace begins to slow down. If you have one hour to finish a five pound challenge, eat as much as you can for the first twenty minutes, using a proper strategy based on the components of your particular challenge. Let’s say that you finish the entire four pound burger, including the bun, in just twenty minutes. Because you finished 4/5 of your challenge in just twenty minutes, you now have a full forty minutes to finish that last one pound of fries and achieve the victory. You may be very full and eating slowly, but you can finish one little pound of fries in forty full minutes!! If you just ate steadily the entire time like it was a normal meal, you would not be able to relax at the end while finishing the remaining bites. Start fast to avoid having to rush yourself at the end!! You always want to do your best to avoid “cutting it close” and finishing within the last one or two minutes. I have done that many times, and it always makes me really nervous. Those last few minutes are very exciting though, and it is a HUGE relief when you open your empty mouth before the last few seconds expire. During my challenges, I always try to “leave no doubt” and finish early well ahead of the time limit, but some days are better than others and challenges come in all different sizes and difficulty. There may be challenges that you finish well ahead of time and there may be really big challenges where you have to use the entire time limit. No matter what the challenge is and what the time limit is, be sure to start quickly and get most of the meal down in the beginning while you are fresh, empty, and feeling strong. The human body can be very unpredictable at times, so you need to hurry up in the beginning to allow yourself extra time to finish at the end. If you hurry yourself and try to force the food down, your body may fight back and you may end up getting sick, causing you to be disqualified and lose the challenge. If you allow yourself extra time, you can feed your body the last few bites gradually and let your stomach slowly expand to fit the remaining few bites. Just make sure you don’t take that extra time for granted and act like you “have all day” to finish. Get the food down and get the win!! You will get that win much more easily though if you start quickly and allow yourself enough time to coast to victory. Thanks for reading “Start Eating Fast And Then Coast To Victory” and using FoodChallenges.com!! To go back and view other During The Challenge articles, click here.